Purina One Small Dog Beef & Rice Dog Food is a nutritious recipe for pooches above 1 year. It's rich in Beef with enhanced levels of antioxidants for a healthy immune system and essential nutrients to promote oral health. Support small dogs' faster metabolism with specially adapted high levels of protein and fat. Nutritional additives (mg/kg): Vit C 210,, Ferrous sulphate monohydraten 212, Calcium iodate anhydrous 2.7, Cupric sulphate pentahydrate 42, Manganous sulphate monohydrate 101, Zinc sulphate monohydrate 358, Sodium selenite 0.25, Antioxidants. **Only the same dry and wet variant of PURINA ONE Small Dog should be mixed together for your small dog to get the benefits of it: (e.g. 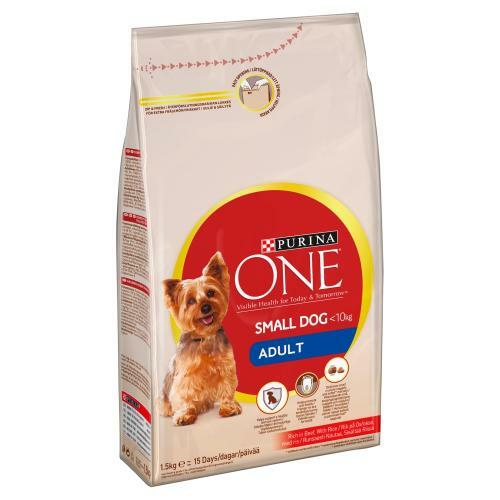 : the dry and wet variant of PURINA ONE Small Dog Weight Control for a small dog that requires weight management).